When the Steve Jobs biography launched last week one of the first things spotted in the book was that Steve said “I’ve finally cracked it” when talking about an Apple TV. Since then a number of rumours have been put online. What we see now is that a Flickr user has created a mockup of what the TV could look like along with some of the features it will have. It is being called the iTV in the mockup (not to be confused with the UK TV channel of course) and is said to be controlled by Siri, be 3D, have iCloud/AirPlay and HD FaceTime, run apps and have a multitouch screen. Lets take a quick look at each of these features to see if Apple [AAPL] will really bother with some of them. Siri integration – I can see this happening. Controlling a TV with your voice could happen although it would likely need some type of bluetooth trigger to know when you are talking to it. 3D – Unlikely. Not in the first few generations as 3D is still in early days. iCloud/AirPlay and HD FaceTime – Yes to all three of these. Integrating a camera makes sense and would allow a group of people to chat, such as a family gathering. Also being able to stream from iPad to TV would be good as well as being able to access photos and all other content from iCloud. Apps – Of course. I can see some useful apps being integrated. Perhaps not the same type seen on the smaller devices as a touchscreen probably wouldn’t be used on this TV. Multitouch – Unlikely. Who would want to stand up to control their TV? Steve Jobs mentioned a year or so ago that Apple had tested multitouch on the iMac but fatigue in the arms of the user made it impractical. TVs are for sitting in an arm chair and watching, not for standing a few feet in front of and playing Angry Birds. I’d also see the design of this TV different than the mockups. Apple is going more towards getting rid of the bezel. I’d expect the screen to almost go edge to edge on this device. I’d also expect the iPhone and iPad (any iOS device in fact) to be able to be used as a remote control. Simply install the iTV Remote Control app and get TV listings on the iPad or iPhone which can be easily selected. 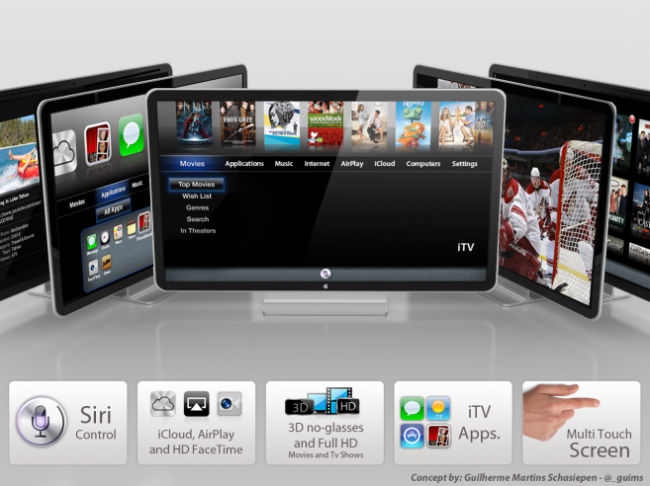 Apple has certainly come a long way with iOS and Mac OS X Lion and could use a lot of those functions in an Apple TV.